Lenora cheering on Marathon High students at the 2015 Austin Marathon and Half Marathon. Lenora Goessling is Marathon High’s Program Director. My life is driven by goals. My husband and I sit down at the end of December for a formal goal setting session for the new year. These goals get printed and hung in our bedroom, our kitchen and other places around our home. I’ve had marathon time goals, qualifying goals, Ironman Triathlon goals, academic goals, professional goals, financial goals, fun goals. I have dozens of handwritten plans to accomplish these goals and formal trackers to track my progress towards these goals. You can guess how excited I was in July 2012 when I was hired by Marathon High to write the curriculum and had the freedom to write lessons that aligned to our pillars. Day 1 Lesson 1 became Setting Goals: The Austin Marathon and Half Marathon Finish Line. An obsession of personal goals has turned into a privilege of watching youth around me set and accomplish their own goals. My story of Marathon is told through the participation and accomplishments of our coaches, parents, donors, staff members and most importantly students. I find it a privilege to witness youth in our town set such ambitious goals of 13.1 or 26.2 miles and then watch them for six months tackle the obstacles that are thrown their way and do everything they can to accomplish those finish line goals. – Eric Garcia at Travis HS set a goal last year to break 4 hours in the marathon. He missed it by 12 minutes. Those 12 minutes fueled his actions for this year as he set a goal to break that 4 hour barrier. I watched him and his coaches, Mary and Austin, discuss ambitious but achievable pace work during our long runs. I saw him give it his all during mile repeats at weekday practices. I saw him connect with 3:25 pacers for Decker and Rogue 30k to be able to “feel how fast I need to go”. Then I saw what six months of dedicated training towards a goal did for him when he crossed the finish line of the Austin Marathon 30 minutes faster than last year. – Zane Trevino at Ann Richards would not talk to me last year after the marathon and told me she couldn’t handle my enthusiasm because she was in so much pain. It was obvious she didn’t want a repeat of that as she trained all summer and came back this year to beat her PR by 80 minutes! Again, she wasn’t all to entirely impressed with my enthusiasm and said simply, “well this year I didn’t walk”. It’s this simplicity in her acknowledgement of what it would take to achieve her goals is why I love my job. – Alex at Eastside ran with us last year and completed the half marathon after deciding he wasn’t ready for the full marathon. He came back determined this year to be a marathon finisher and his actions at every practice and long run reflected that goal. He crossed the finish line of the Austin Marathon and Half Marathon as a marathon finisher this year. – Gabriela at East Austin College Prep had tears of joy as she crossed the finish line of the marathon saying, “I can’t believe I have this beautiful opportunity to be a part of this”. Her view of being able to complete 26.2 miles as an opportunity inspires my own work and running. What a refreshing outlook on being a runner. 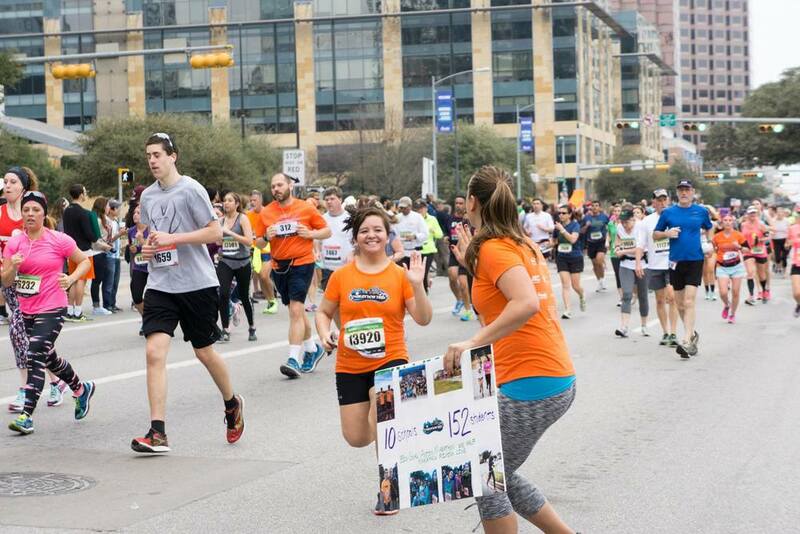 – Carol was an 8th grader at Dobie middle school last year and finished the half marathon. As a 9th grader this year she had the opportunity to attempt the full marathon. Even though she wasn’t a student at one of our current high schools, Carol met with me at the beginning of the year asking if she could still run with us because she wanted to become a marathon finisher. Her dedication to this goal while training by herself reflected in her joyful tears and smile as she accepted her marathon finisher medal. – The accountability that was built between our Dobie Middle School students rivaled that of some of the adults I train with. On their Facebook page, they cheered each other on, reminded each other to train during off days, motivated friends to come to practices and shared their mantras. During practices no one ran alone. During timed miles, the students that finished faster continued to run to finish with their slower teammates. One of our pillars is to develop strong community members. Our students at Dobie exemplified this. – I attended a practice at Reagan High School late fall during a timed mile. It was pouring down rain and one of the first really cold days of the season. Yet every student was at practice and every student improved their timed mile. This dedication of reaching their goals and overcoming obstacles inspires my work. – There is nothing better than being able to witness the Marathon High coaches dedicate themselves to the goals of their students. From rides to and from practices and races, running additional miles to be able to keep their students company, writing individualized race plans, having goal conversations, working with groups of 100+ students, our coaches are the reason 99% of our students that started the marathon finished the marathon. The picture above, as our friend Josh Baker at AzulOx Photography says, “about sums it up”. It is a privilege to work for an organization where I get to set up the opportunities for students to set goals and achieve them. It is a privilege to stand on the sideline and watch them tackle these goals with smiles like the one above. It is a privilege to know that Rogue Running runners and the Austin Community believes in us. Onward to 2015-2016, we’ll see you at the Austin Marathon and Half Marathon finish line.